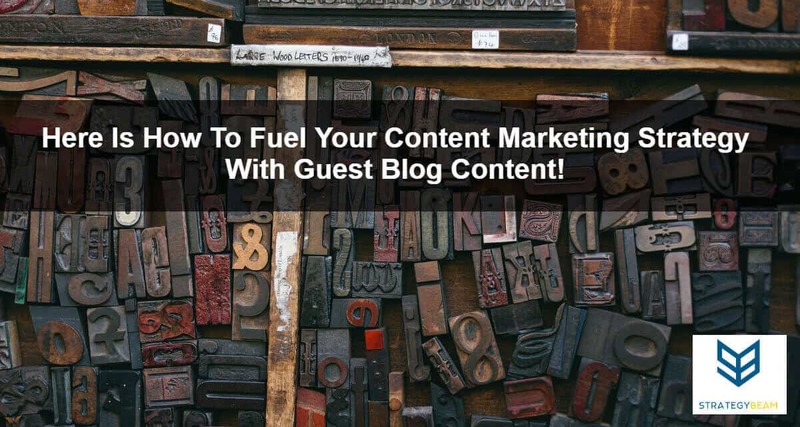 Here Is How To Fuel Your Content Marketing Strategy With Guest Blog Content! One major problem you can face when looking to grow your business is consistent, high-quality content for your blog. Without offering your community with a large amount of content on a regular basis, your community will stagnate, and you will lose your competitive edge. This is your business, and everything you publish on your website needs to reflect your professionalism. You should only post high-quality blog posts from writers who have a track record of publishing quality posts. However, it can be expensive to constantly pay someone to write blog posts for your company. This is where guest bloggers come in because this type of content usually costs your company no money and only requires a backlink. Guest bloggers will provide your website with great content and all they are looking for in return is the ability to network with you and get a backlink to their site! It can be daunting to produce quality content consistently for any webmaster or business owner. This is why guest blogging can be valuable to your business and your online audience. The right guest blogger can help you carve out a strong position in your niche and connect your business goals and customer needs. As a result, a professional guest blogger can help you publish great content for your audience while also helping you position yourself in your market for ongoing success. You need to be cautious in who you choose to write for your brand, and this is why you should only choose a professional copywriter who knows how to produce great content through guest blogging. My background makes me the ideal guest blogger for your business. For more than 13 years I have worked with SEO Copywriting and digital marketing, so I am up to date with the latest best practices that Google and your readers expect from blog content. I will bring my knowledge and experience to your business to help you publish great content to educate your readers and drive conversions. I will bring my knowledge and experience to your business to help you publish great content to educate your readers and drive conversions. As a guest blogger, I offer my best work for free, and only ask for a backlink from your website! I take pride in everything I write. This means you will always receive my best work. I love to learn and research, so when I write guest posts for your business you know that you will be receiving highly researched and solid subject matter that matches the needs of your audience. To ensure that your business receives valuable content to share with your community I will work with your company to produce great blog posts to educate and entertain your audience. Each guest blog post I write is optimized for your readers and crafted to meet your quality needs. I write guest posts that meet your needs and range between 600-1500 words for each post. Perform comprehensive research on your topic. Optimize each article for readers and then tie back to your business and mission. Work with you to understand your audience and determine the subject matter. Craft high-quality and original content your audience will love. Ensure that each article is checked for grammar and excellent readability. Share on my social media networks to my community. Since your customers demand the most out of your business, you should demand the most out of your guest bloggers. To ensure you and your readers find value in the content I provide, I will work with you to understand your market and business goals. This information will direct me to create valuable and relevant content and ensure that your readers fall in love with you as a thought-leader. Take 25 seconds to fill out the easy form below if you are ready to hire a professional freelance copywriter to help your business grow. We look forward to speaking with you and we will return your message ASAP!